Zazzle Cupon Code for Invitations and Cards! - Oh So Girly! Enjoy this great opportunity to get ready for the Holidays season. While some will think that Christmas is still far away, remember that customizable products take a longer time to be produced and shipped. 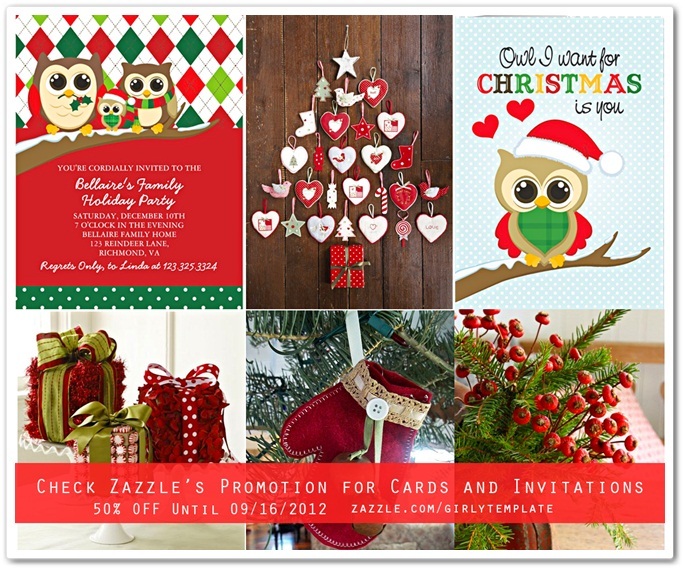 That’s why Zazzle is already offering 50% OFF invitations and cards. With a huge choice of designs and templates, you can customize most of Zazzle products with your own name, monogram, text or photo. Find the perfect card for you and your family or create one from the scratch! Hurry up and use the code: HCARDSAVINGS . Promotion ends the 09/16/2012. You can check Zazzle’s Holiday cards HERE. Thanks for answering!! I really love your blog—its so girly! I love it! I’m definitely following you!